Parlour Diner is a small American themed eatery tucked away on the Windsor end of Chapel Street. It is so modestly decorated that you might even make the mistake of just simply walking by without a second thought. 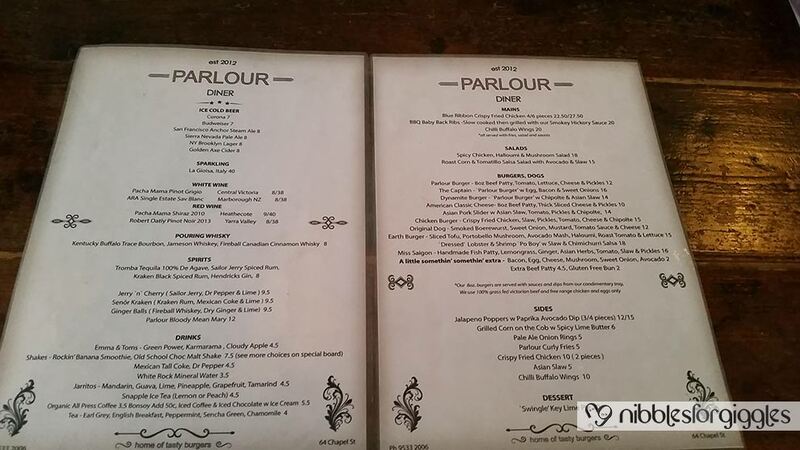 However, Parlour Diner is an American restaurant deserving of a double take… Or triple take! Not only is the diner constantly bustling with hungry bellies during feeding hours, there is no American themed dress code for waitresses and no American inspired booths. Although serving American style cuisine, Parlour Diner is well and truly touched with Melbourne influence. Unlike other eateries around Chapel Street which are quite large and well… overpriced, Parlour Diner’s modest fitout is pleasantly reflected in its price and food quantity as well! Parlour Diner is small in size with only a few tables, inside and out, and seating at the bar. When we arrived and it was already so busy that there was only space at the bar – which incidentally was great because you can sit, eat, and drink at the bar whilst talking to the friendly staff behind the bar making drinks. With old R&B (Rhythm & Blues) and Rock & Roll being played in the background (anything from Led Zeppellin to The Doors), intimate seating, modest decor, and friendly staff – so far, what’s not to like?! We were in a great mood upon entering and as we were seated at the bar, we could see the chefs whipping up the food which got us super excited – let us tell you why! As the Parlour Diner is a compact joint, staff numbers are small too. Altogether this makes for a more cosy sitting and the staff are so friendly that we felt we knew them a bit better by the time we had finished due to the conversations with them. Although busy during peak hours, the limited number of tables also meant that we were still served quite quickly. We were always made to feel welcome from the point of arrival and they didn’t rush us out the door once we had finished. All food and drink came with a smile. They didn’t need to do much though, with great music, the smell of food, the sight of food, and the shakes arriving quite quickly, we were in a happy place. The drinks arrived first – they were actually made right in front of us which was very entertaining to watch (though secretly wondering how much exercise would be needed to work it off…). They came in big cocktail shaker like cups which meant it was already good value for money. Both the Malt Vanilla and Salted Caramel shakes had a great taste – creamy and thick with a very generous portion of ice cream; the salted caramel was delightfully rich. Oddly enough, provided the perfect accompaniment to the fried deliciousness we shall call food! The Crispy Chicken and BBQ ribs then came out. Our eyes lit up with so much excitement – now, let’s begin with the chicken. The 6 pieces are huge. It is like having 6 chicken breasts on a plate – but all fried and beautifully crispy. The batter is crunchy, golden in colour (with a red tint), light and there is a slight sweetness too. This led us to think it might have had sun-dried tomato flavours in the batter…. Or tomato and sweet chilli…or something like that. Inside the batter, the chicken is moist and succulent. It really is a fantastic plate of crispy chicken. No bones, great flaky flavoursome batter, a perfectly cooked chicken breast, AND, we had 5 more beauties on the plate! You also get a honey mustard and green chili sauce to dip, and there are also curly fries and a small salad. They are great curly fries too. Nice and crispy on the outside, soft and fluffy potato inside. Just yum yum yum. If we paraphrase the film ’21’ – ‘winner winner chicken dinner’. Seriously, this plate could easily feed two people and you wouldn’t need anything else. For the big eaters out there, you are fine with just 4 pieces to yourself, but if you want to test yourself…! We felt spoilt. Next to the chicken we had a huge plate of ribs (plus of course more curly fries and salad). The meat just fell off the bone as soon as the knife went through it. It was melt-in-the-mouth kind of stuff, and the sauce was just sensational. In fact, we were using the smokey hickory sauce for the curly fries too instead of the side dip of honey mustard and green chilli. It was a great dish of BBQ ribs. We have had ribs from other places and they have not been as good nor plentiful! We were stuffed and the staff very kindly offered to doggy bag our remaining food we couldn’t finish. A great chicken sandwich or salad for the next day! We couldn’t believe we hadn’t heard of Parlour Diner earlier. Great food, great portions and at a price you don’t even have to think twice about! Especially if you are already thinking about going again…and yes, it goes without saying we will be going again (we haven’t even got to the burgers yet and rumour has it they are just as good!). With great music and super staff, this small diner packs a huge punch and really just smashes other diners out of the water. It has very, very quickly become one of our favourites! We have yet to do breakfast, the burgers, and the other shakes so we definitely plan numerous visits back. Parlour Diner differentiates itself from the other eateries and diners on Chapel Street and around the area, in portion size and price, and we don’t expect it to be long before more people know about this place. So why should you come here? Fried American goodness – check. Portion size – check. Price – totally worth it. P.S. It seems like you can order food to take away too, again, what’s not to love? !